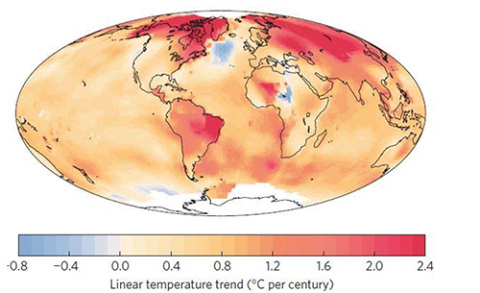 For nearly three decades now, prominent climate scientists have been warning policymakers that salt and heat driven circulation of the world ocean system (called thermohaline — thermo for heat and haline for salt) could be disrupted by cold water outflows from Greenland. There, in the North Atlantic, salty, dense, ocean water issuing from the tropics along the Gulf Stream begins to cool. The heavier water, burdened with salt, sinks to the bottom in the North Atlantic. This sinking, in turn, drives a massive ocean conveyer belt. It delivers colder, oxygenated water to the deep ocean. It dredges less oxygen rich bottom waters to the surface where they can be reinvigorated. And it drives this ocean revitalizing train of currents through every major corner of the world ocean. A disruption of this ocean water mixing machine would ripple through the world oceans like a gunshot to a vital circulatory organ, reducing oxygen levels throughout the whole ocean system, and greatly reducing the oceans’ ability to support life. It would be a major shift toward a stratified, less life supporting ocean, and one step closer to the nightmare ocean state called a Canfield Ocean (named after its discoverer — Dr. Donald Canfield). Warmer, salty water cooling and sinking in the North Atlantic is an essential cog in the wheel of this massive ocean water overturning machine. It has also been described (as Dr Box notes in the video above) as the Achilles Heel of global ocean circulation. But I like to think of it more as the world ocean’s beating heart. The reason is that any disruption of the overturning process in the North Atlantic basically kills off a life-giving circulation to the entire world ocean system. Now, a new 2015 report headed by Dr. Stefan Rahmstorf finds that the world ocean system is cooling in exactly the wrong place — the North Atlantic just south and east of Greenland. This cooling is an indicator that a high volume outflow of cold, fresh water is entering this region of ocean. A cold, fresh outflow that comes directly from the melting glaciers of Greenland itself. A cooling and freshening that creates a physical block to salt water down welling in the North Atlantic. The kind of block that can directly disrupt the Gulf Stream and the rest of ocean circulation on down the line. The North Atlantic between Newfoundland and Ireland is… the only region of the world that has defied global warming and… cooled. 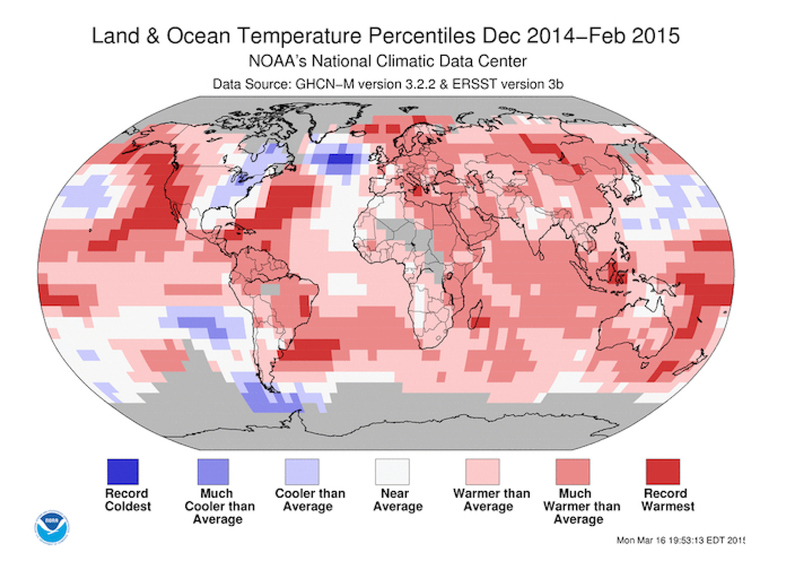 Last winter [this region] was the coldest on record – while globally it was the hottest [such period] on record. Our recent study (Rahmstorf et al. 2015) attributes [ anomalous North Atlantic cold water] to a weakening of the Gulf Stream …, which is apparently unique in the last thousand years. Unfortunately, an expanding pool of cold, fresh water in the North Atlantic is not just a threat to ocean health. It also represents a zone of anomalous cold in a region surrounded by atmospheric and ocean warming. As such, it represents a zone of likely expanding atmospheric instability — one involved in the shift of the cold center of circulation from the polar zones and more toward Greenland and Canada. Parcel to the kinds of weather disruptions that have been described in the theories of Dr. Jennifer Francis and during some of the later works of Dr. James Hansen (alluded to in The Storms of My Grandchildren). As such, cold water bleeding from the great glaciers of Greenland not only poses a threat to ocean circulation, it also poses a risk for generating significant disruptions to atmospheric winds and related weather as well. Ones that could set off increasingly intense storm events in the Northern Hemisphere similar to what was seen for the US Northeast this winter (but likely worsening with time) and the extraordinarily powerful barrage of storms hitting England during the winter of 2013-2014. Dr. Hansen in his Greenland Ice Sheet Loss: Exponential? paper warned of the potential for continent-sized frontal storms packing the strength of hurricanes under some rapid Greenland melt scenarios by mid-century. Hollywood dramatizations aside, this is more than enough real world weather and climate trouble to pose serious cause for concern. And as Dr. Rahmstorf, Peter Sinclair, Dr. Jason Box and Dr. Mann allude to the header video — the policy makers were warned well in advance. What’s Going on With the North Atlantic? Greenland Ice Sheet Loss: Exponential?